Some dress boots miss the point; You do not spend your whole life dressed up. The Blundstone Chisel Toes understands. This is a boot that's as comfortable on the trail as it is in town. And the polyurethane soles make a lot of sense in a country like Canada where winter can often be cold - Not to mention wet, slushy and miserable. They love the punishment. The thinner sole profile lets you dress them up or down - Chisels do a nice job of chipping the formal 'edge' off a suit. The patented Shock Protection System absorbs 33% of the abuse so your bones and joints don't have to. Weatherproof leather uppers fused into the soles dressy or casual. your call. Square toe, medium width. 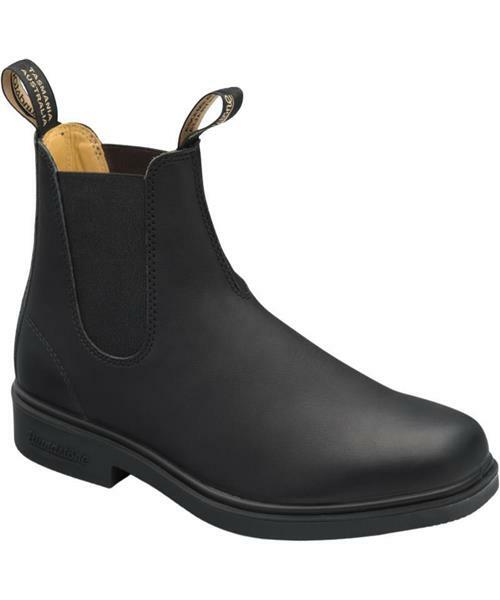 ** All Blundstone Footwear are sold under Australian Sizing. ** For Women, Subtract 3 sizes from your Canadian Size. ** For Men, Subtract 1 size from your Canadian Size.